My Movies supports the connection between a disc title and a TV series. 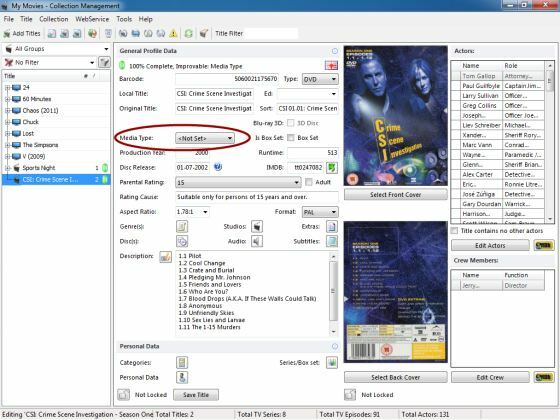 This allows you to see a disc title as a TV series, and get all the detailed information about the TV series and extended functionality for the disc title. If a newly added or updated disc title in your collection is registered on our servers with a connection to a TV series, and the episodes on the disc title has been set, you will be able to see the detailed series and episode information for the disc title in both My Movies for Windows Media Center and My Movies Collection Management. If only the media type for the disc title has been set to TV series but no futher connection has been made, you will still be able to see the disc title under the TV Series section in My Movies for Windows Media Center. 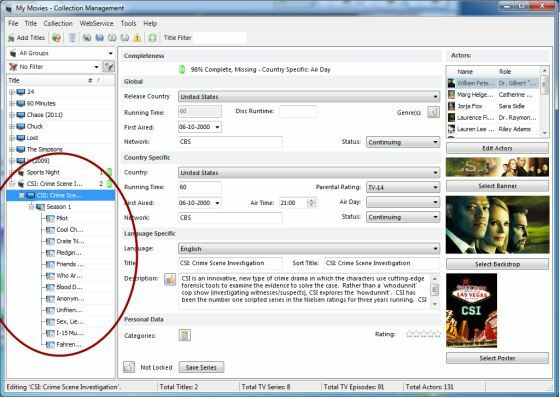 If the relevant connection between a disc title and TV series + episodes has not been set, you can easily set it yourself and this guide will show you how this is done. The guide will run through the proces of registering the disc title, setting the media type, connecting to the TV series, setting the episodes on the disc, and finally contributing the data to the WebService. 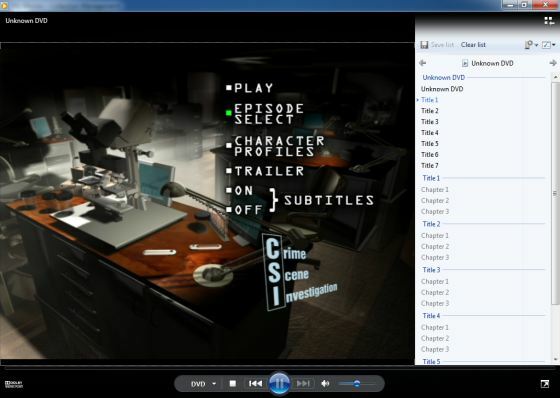 We will be using the Crime Scene Investigation (CSI) - season 1 episode 1-12 disc set as an example throughout the guide. When working with the addition of new data to a title, we should add the title by barcode to make sure it is the correct title that the data is added to. Alternative if it is a title already in your collection, you should check the barcode with the one on the DVD box. 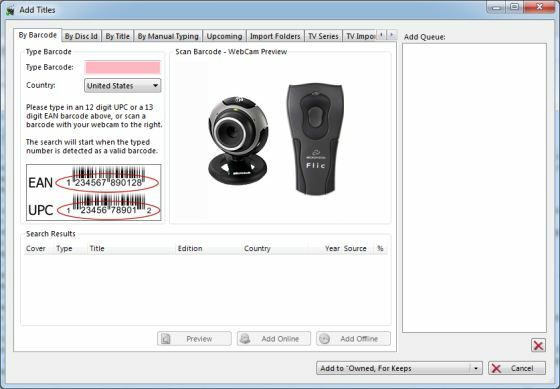 The follwing screenshot shows the Add Titles dialog in the barcode view. In the next screenshot we can see that the title is in our collection, and that its media type has not been set. When you change the media type to TV Series a new button apears next to media type selection box. 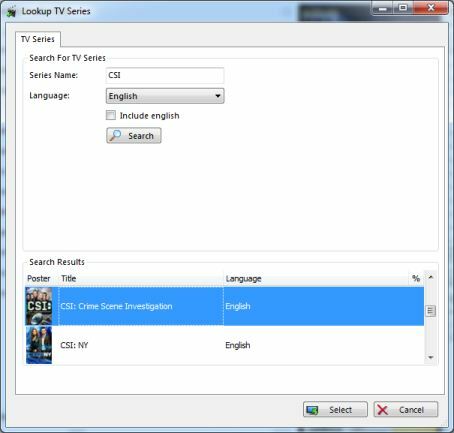 Pressing the lookup button will open the Lookup TV Series window in which you can search for the series in the languages you want to. Now the disc title is connected to a TV series, and the lookup button has a changed icon. This might be a good time to save your changes. The next task is to set the episodes on the disc title, which includes specifying where on the disc the episodes are, so that My Movies for Windows Media Center can start the individual episodes. To do this we open the Assign Discs window. In the picture above we can see the discs that belongs to this title in the blue circle. If there are no discs or some are missing you can add them by clicking the button in the yellow circle. In the green cicle you can see the disc ID for the specific disc. This is not something you can read on the disc, but this disc id is the machine readable id of the disc, and the id must be read from the original disc. Now to edit the episodes press the Edit Chapters or Episodes button marked by the read circle. If the structure of the disc is unknown it must be read from the original disc, this is shown by the next three pictures. Specify in which drive to read the disc. Make sure it is the correct disc. 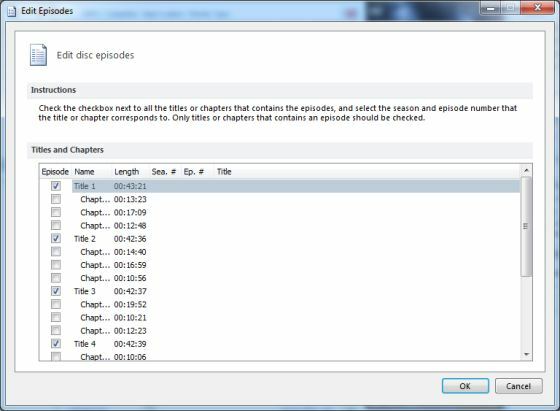 Now we got the Edit Episodes window where you can see all the titles and chapters on the disc. 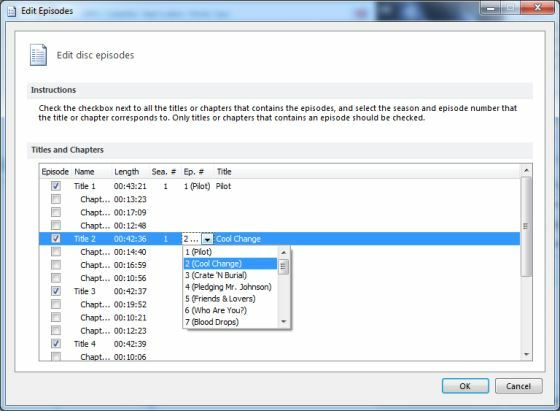 Here we match either the titles or chapters to the episodes by setting the mark in the first column and then selecting the season and episode number. There are different ways to figure out where the episodes are on the disc. A good way we know of is to use Windows Media Player. 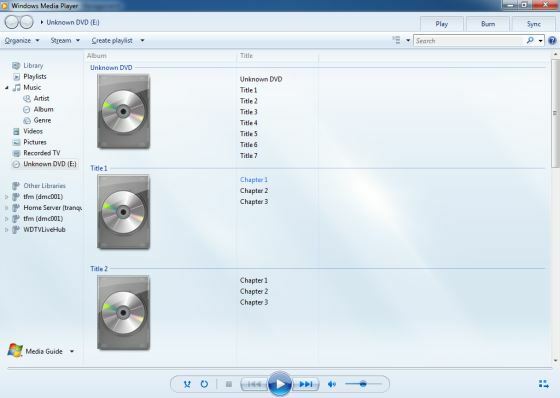 In Windows Media Player you can use the library view to see the structure of the DVD, or the list that can be shown while the DVD is playing. 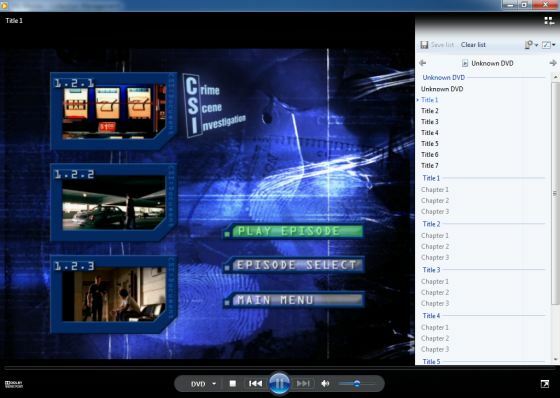 The next three images shows the library, how to select the list, and the list view while the DVD is playing. 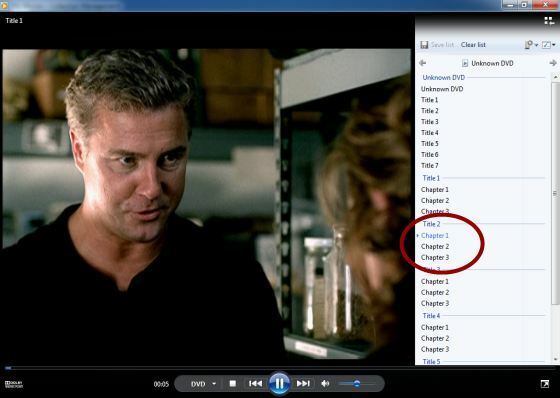 In the Library view you can double click on the titles and chapters to see where they lead to on the disc. In the list you can also click on the chapters but not on the titles. 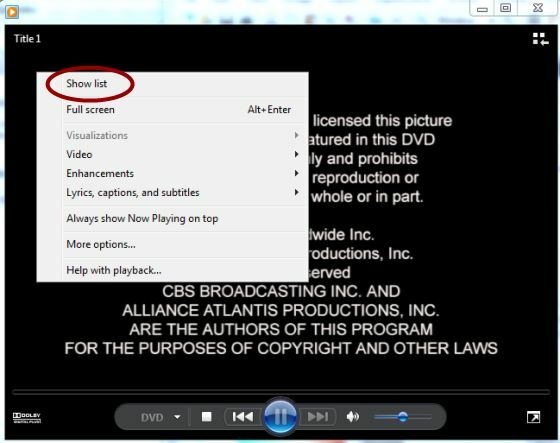 In the list you can also see what is currently playing by the marking and thereby determine where the episodes are located. If the disc title has episode selection as our does in the picture above it is really easy just to choose an episode, and then see in the list where it starts playing. That is what we have done in the next two images. Notice that the marking in the list in the above picture is on the Chapter 1 entry, however the actual episode is the Title 2 in this case, as the three Chapters under Title 2 corresponds to the menu choices that can been seen in the first picture. If we go back to the Edit Episodes window we can also see that the title time matches the time of the episode. So now we choose the correct season and episode from the drop down lists that already has been filled with the data for the TV series. 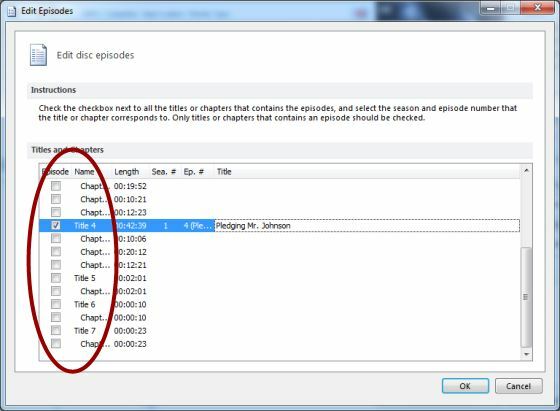 Please be aware that it is not necessarily all titles or chapters on a disc that corresponds to an episode, and you should only mark the ones the do, as seen in the next picture. 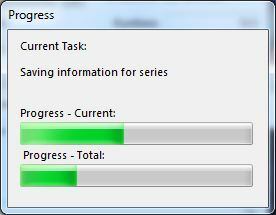 When you are done matching the episodes on the discs and you press the OK buttons, the episodes data is downloaded from the WebService to your collection. After the connections to the series and epsiodes are made, the disc title will work just like a TV Series. In Collection Management this is shown by the (+) sign in front of the disc title. 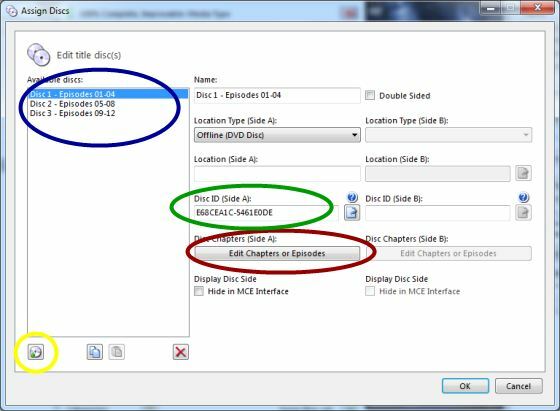 When you press the (+) sign the TV series and the episodes on the discs are shown under the disc title as seen in the following picture. When all the discs in the disc title has been matched to the relevant episode and you have saved the TV series you should contribute the data for the disc title, so that this connection information is saved in the WebService and thereby made available for all users. This last picture shows where this is done.